Brian has already reported to some of you (the Centre’s Exec), but I feel that I should report as well. At any National Council meeting or Annual Meeting at a GA, the vast majority of the motions are routine, non-controversial, housekeeping matters. The motions that generated strong feelings and lengthy debate were all related to trying to get the RASC’s finances in order since we are expecting a $36,000 deficit this year. These issues dominated discussion at the 1st National Council meeting on Friday, at the Annual Meeting on Sunday morning, and at the 2nd National Council meeting on Sunday afternoon. At the Annual Meeting the proposal to remove the general membership’s right to vote on and ratify fee increases was defeated soundly. Since it would have had to pass with a two-thirds majority, its defeat was widely expected. I voted to retain your current right to vote on fee increases. The related measure to change the current 60/40 split between national and the centres (the centre receives 40 percent of your membership fee) also failed to pass since it was linked to the first matter within the same motion. In contrast, the actual membership fee increase of $5 per annum was not controversial and passed in less than a minute with little or no debate by a huge margin. I voted for the fee increase since the Society is in dire financial straights. It was moved by Dave Lane, seconded by James Edgar, that references to the words “the Journal” in Bylaw #1 refers to a publication of the RASC published in electronic format and specifically it does not refer to a printed version of the same publication that may be made available by subscription to members, non-members, or institutions. Dave Lane, seconded by James Edgar, that the combination Printed and Electronically-Delivered Journal proposal be implemented by the Publications and IT Committees as proposed in the document dated 2005-05-04, except the changes to the Society’s by-laws indicated in Appendix 2. The implementation details, subscription pricing, and phase-in details shall be approved by the Executive Committee. It was moved by Brian Kelso, seconded by Alan Whitman, that Motion 05306 be postponed until the National Council meeting in October 2005. So the result of all of this appears to be that we can proceed with implementing an electronic JOURNAL if motion 05306 passes at the October 29th meeting of National Council. This gives every centre including ours time to debate the issue thoroughly in the meantime. Note that the proposal would make a paper copy of the JOURNAL available by subscription, probably in the $15 to $20 range. [Although I note that Jay Anderson, the incoming editor of the JOURNAL, said make it one or the other, not both.] None of this should be seen as an attack on the Journal’s worth — it is simply a reality that the RASC’s finances are heading downhill rapidly and something drastic has to be done. The obvious target is the JOURNAL since the national membership survey done a couple of years ago found that the membership values the Observer’s Handbook and Sky News more than they do the JOURNAL. I was re-elected to the national Finance committee and was also elected to the Observing committee. My Finance committee duties certainly colour my approach to these matters. Brian Battersby agreed to sit on the national Education committee. This entry was posted in 2004 / 2005, Meeting Minutes, Special on May 25, 2005 by glen_h. Meeting called to order at 9:10 p.m. The polar alignment scope will be ordered for the CG5 mount. UNBC’s Dr. Patrick Mann prior to the business meeting presented a lecture on Computational Physics. This entry was posted in 2004 / 2005, Meeting Minutes on May 25, 2005 by glen_h. 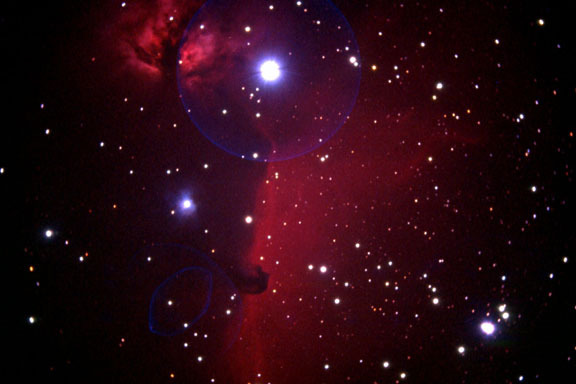 This entry was posted in Astro Photos of the Month on May 13, 2005 by glen_h.